There are numerous Cowgirl Hairstyles women can choose from. These hairstyles are among the top rated in the society. Women are mostly judged based on their outfit and the type of hairstyle they have adopted. You shouldn’t stress yourself over checking out top notch hairstyles in the market. Below are some marvelous cowgirl hairstyles worth checking out. First, you must have long hair to consider this amazing cowgirl hairstyle. It is characterized by drawing a line from the hairline in the forehead that extends into the middle head. This line dives hair into two parts. Thereafter, plait your hair one each side of the line in a descending manner. The hair on both sides should conjoin and pair up at the back of the head. Afterwards, take your fringe hair, divided into two parts and start plaiting it straight. You can spice up the look of your braids by plaiting it differently as you approach its edge. Finally, sweep both braids sideways. Are you looking for a simple hairstyle that will give you that cowboy look? If yes, you should consider the urban cowgirl hairstyle. It is characterized by separating the mid head hair from the side hair on both sides of the head. Afterwards, blonde and highlight color should be unevenly distributed throughout your head. Moving on, hair on each side of the head should be combed straight before being given a wavy look. Conjoin your fringe hair with your middle head hair and start plaiting it backwards. Form a bun look style towards the end of the braid. This is one of the simplest to achieve hairstyle. Your stylist should give your head a blend of both blonde and black color. Blonde color should supersede the black one. Thereafter, comb all your fringe hair backwards to conjoin with the middle head hair. Conjoin this hair and comb it towards the back of the head, leading out a section of the side head hair hanging straight. The side head hair on both sides of the head should conjoin at some point towards the end of the mid head. Afterwards, plaiting should conjoin backwards until towards the edge of the hair. As the name suggests, this cowgirl hairstyle puts focus towards the right side of the head. Above all, you must have long hair to be eligible for this marvelous hairstyle. This hairstyle entails two activities, namely plaiting and dying your hair. Your hair must attain a blend of black, blonde and highlight color. These are a few things worth checking out. In addition to all these, your hair should be divided into three bits. Each section of the hair should be plaiting uniquely. This is in terms of the size of the braid, among others. All head hair should be directed towards the right side of the head. The classic cowgirl hairstyle has been there since time in memorial. This is one of the few hairstyles that can be incorporated on any type of hair. Start off by low drying your hair to give it a soft texture for easy combing. Proceed on and divide your head hair into two main parts. Each section on each side of the head should be combed straight up to a specific level, after which plaiting should commence. Add spice to this hairstyle by wearing a cowboy hat. Are you looking for a cowgirl hairstyle that gives you the opportunity to showcase your long and beautiful hair? If yes, you should check out shoulder sleek hairstyle. It is pretty straightforward in that you can easily attain on your own. Simply sleek back all your head hair towards the back. Conjoin all your hair to make it clung on each other. Afterwards, direct it onto the left shoulder. You can spice its look by giving a wavy look. Finally, wear a cowboy hat for a fantastic look. This is one of the latest hairstyles women should check out. It attained this name because your hair looks like tendril. Start off by dividing your side head hair into two main parts. Plait each section and conjoin them together while directing them towards the left side of the head. Plaiting should be handled up to a certain level, whereas the rest of the hair should be left free. The rest of the hair, including fringe hair should be combed towards the left side of the head. Choose sleek back ponytail hairstyle if you desire to give your long hair some breathing space. It is characterized by all your head hair being sleeked backwards, expect the fringe hair. Your sleeked back should be conjoined at the back of your hair by some section of your side head hair. 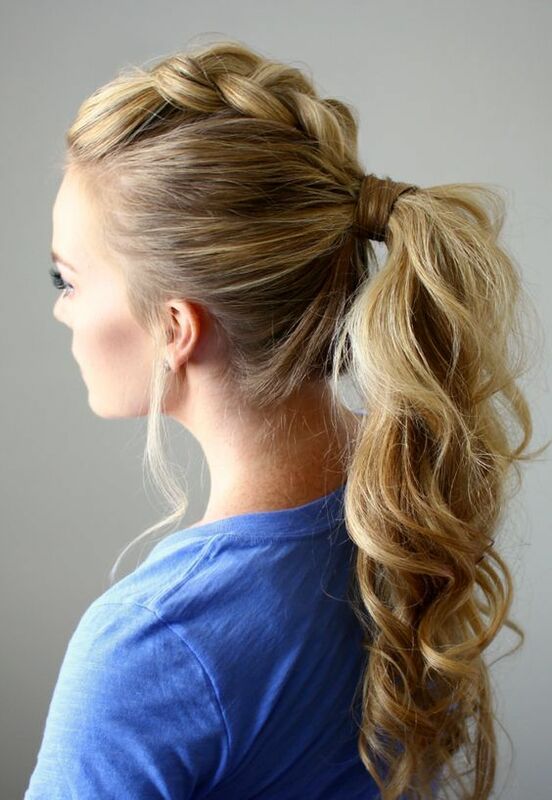 Afterwards, give the rest of your suspending hair a wavy look as it forms a ponytail. That’s not all; take your fringe hair and plait it into medium sized braids. Finally, your fringe hair should rest near the conjoining point of the rest of the hair. Take advantage of this hairstyle if you desire to showcase your pretty soft hair. The cute home hairstyle is well known for achieving a complete blonde look. All your middle head hair should be combed towards the left side of the head. Additionally, most of your fringe hair should be directed towards the left side of the forehead. Ensure your hair is given a wavy look to add spice to your beautiful hair. The hair on the right side of the head should also attain a wavy look. Above all, it should rest immediately after the forehead. As the name suggests, this top notch hairstyle focuses on giving you a curly-wavy and cowgirl look at the same time. Long hair is encouraged for anyone who is considering this hairstyle. Blow dry your long hair to give it a soft texture that can be combed into different direction. Afterwards, give your hair a curly-wavy look before combing it into its natural growing direction. This statement doesn’t apply to the fringe hair. Fringe hair should be divided into two parts and combed sideways. Add spice to this hairstyle by wearing a cowboy hat. Are you running out of time in choosing a simple temporary hairstyle for your hair? Look no further. Check out the simple boho hairstyle. You must have a blonde or soft hair to attain this simple yet outstanding look. Conjoin your fringe and middle head hair and comb it backwards. Your head hair should be divided into two main parts when it reaches some point in the mid head. Here, give hair on each side a way look before conjoining each part to form a bun. This is one of the rare hairstyles among women. Therefore, consider it if your love uniqueness among your peers. Attention is given to the left side of your head. Give your hair a blend of blonde and black look. The blonde color should occupy most part of your hair. Afterwards, your stylist should plait your hair from the forehead towards the left. This should continue until it almost reaches the edge of the conjoined hair. It is definitely worth trying out. Consider this wedding hairstyle if you are hosting one or attending one. The wedding cowgirl look hairstyle can comfortably be adopted by any type of hair. Your stylist should start off by blow drying your hair. Thereafter, your stylist should comb your hair towards the back of the head. That’s not all; your side head hair should be braided and conjoined in numerous ways to form a flower look design. This is what makes this cowgirl outstanding and be ranked among hairstyles women should consider for their long hair. Are you attending a party anytime soon? If yes, consider this splendid hairstyle. It is characterized by the middle head hair being combed towards the right side of the head to conjoin with the right side head hair. Additionally, your head hair should be given a wavy look throughout the head. There should be a partition line that separates the mid head hair from that on the left side of the head. A section of the left head hair should be plaited. It is definitely worth checking out. Are you a fan of cowboy hats? If yes, this hairstyle is designed specifically for you. It is characterized by combing your front view hair into two different directions. In addition to this, your stylist should give your hair a curly-wavy look once its approaches the shoulders. Above all, the length of hair on both sides should be equal. Spice up the look of your front view hair by giving it a blend of blonde and black look. Afterwards, wear your preferred cowboy hat. Is your busy schedule barring your from obtaining a quality hairstyle? Worry not; check out the sleek boho hairstyle. This top notch hairstyle consist a blend of both blonde and black hair color. This color should be unevenly distributed to give your hair a unique look. Your hair should be combed backwards to make it easy to attain the wavy look. All the hair on your head should be combed backwards apart from the side head hair. The side head hair should conjoin together with a bun towards the end of the mid head. As the name suggests, this cowgirl hairstyle is characterized by a partition on the middle head to separate the front view hair into two main parts. Afterwards, apply gel that makes it easy to separate your hair into multiple groups. Take a section of the front hair on each side of the head and plait it straight. Additionally, give some section of the free hair a wavy look. This hairstyle is encouraged as it is easy to convert to different hairstyles. Boho braided hairstyle focuses its attention on the right side of the head. It is characterized by the top of your hair being black, after which it turns blonde at some point. That’s not all; your hair must attain a wavy look throughout the head. Comb your hair towards the right side of the head. Carefully select you fringe hair and braid if towards the right side of the head. This should also be carried out on some section of your side head. This is one of the few hairstyles that encourage the growth of fringe hair. Start off by carefully trimming your fringe hair to align with your eye lashes. Thereafter, comb your side head hair to its respective side. Thereafter, start plaiting your hair on each side immediately after the ear region. Each side of the head should have at least two braids. Spice up your look by wearing a dark color cowboy hat. In conclusion, this hairstyle can be incorporated by any type of hair. Are you one of those ladies who want their hair to rest above their shoulders? If yes, you should incorporate the sweet girl hairstyle. This is a very simple hairstyle in that you can style it up yourself. You are encouraged to blow dry your hairstyle to make it soft and a bit shinny. Additionally, curl your hair towards its edges. Comb your back head hair towards the left side of the head. It should conjoin with the hair on the left side. Afterwards, you should plait the conjoined. This hairstyle adopts the poker face look. However, it has been enhanced to be categorized as a cowgirl hairstyle. Your fringe hair should be evenly trimmed up to the eyebrows length. Some section of your middle head hair should be combed forward to cover the sides of your face to achieve the poker face look. Additionally, you can attain braid on the left side of the head. The rest of the head hair should be combed towards its natural growing direction. As the name suggests, this hairstyle focuses on giving your hairstyle a redhead look. Therefore, the first step of achieving this hairstyle is making your entire hair attain this color look. Thereafter, your hair must undergo blow dry to make it soft and easy to attain the wavy look. That’s not all; your hair should be styled into different styles. This gives it a unique look. Women are encouraged to consider the redhead cowgirl hairstyle if they desire to give their hair some breathing space. Above all, it can be incorporated into another hairstyle with ease. As the name suggests, this hairstyle states that hair should be combed towards left side of the head. Above all, you must a lengthy hair to adopt the left sleeked hairstyle. Your stylist should braid your hair from the fringe hair on the right side of the head and should extend towards the left side of the head. The rest of the head hair should be combed towards the left side of the head. Women are encouraged to check out this marvelous hairstyle as it can be custom designed to different styles. You definitely not find anyone with this marvelous hairstyle because it is not widely spread. It is one of the latest cowgirl hairstyles. It is characterized by a blend of blonde and purple color. Your stylist should divide your middle head hair into two parts. Afterwards, some section the middle head should be given the purple look. Divide your fringe hair into two parts. Each section of your fringe hair should be braided towards the back and should conjoin with the blackhead hair to form a bun. The rest of the head hair should be combed sideways. Start off by combing your side head hair towards its respective growing style. Afterwards, give it a curly-wavy look all the way down to its edges. Divide your fringe hair into two sections. One section should stretch towards the right side of the head and the rest towards the left. Some section of the side head hair on both sides should be conjoined together and plaited. This is what defines this marvelous hairstyle. As the name suggests, this hairstyle is designed specifically for moms. Mothers are very busy in that some lack the time to attain a good looking hairstyle. Well, the moms cowgirl hairstyle is a very easy to attain hairstyle. You simple need to comb it then give it a wavy look. There should be a partition on the mid head that separates the front view hair into two parts. In conclusion, mothers should consider this hairstyle as it is easy to achieve and maintain. Ever dreamt of your hair being curly throughout the head? If yes, look no further. You should take a look at the phoenix curly hairstyle. It is characterized by curls throughout the head. First, your hair should be combed towards its natural growing direction. This statement also applies to the fringe hair. Please note that the hair size on each side of the head should be equal in terms of length. As the name suggests, this hairstyle focuses on attaining a messy cowgirl look. All the head hair should be combed towards the back. This should occur in sections and should be combed in different direction to attain the messy look. Some section of the side head hair should be conjoined together through plaiting. That’s not all; a bun should be formed at the back of the head. Crown cowgirl hairstyle is easily attainable. It is one of those few hairstyles that can be designed on your own. Simply comb back all your head hair, apart from the side head hair. The side head hair should be divided into two sections. Each section should be attached to its adjacent hairstyle and plaited. The plaited hair should meet at the back of the head. These braids should be directed downwards. Lastly, we have the evening gown hairstyle. All the hair on the right side of the head should be combed towards the back of the right ear. The rest of the front view hair should be combed towards the left side of the head. The hair on the left side of the head includes the fringe hair, the middle head hair and the left side head hair. A wavy look is encouraged on the hair on the left side of the head.